If you think your child has autism then you need to discuss this with your childs school and ask them to complete a referal to the Integrated Service for Children with Additional Needs (ISCAN) Service. 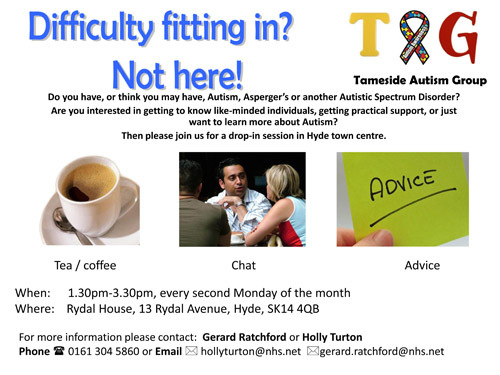 These are based at Rowan House in Hyde. It is a spectrum condition, which means that, while all people with autism share certain difficulties, their condition will affect them in different ways. Some people with autism are able to live relatively independent lives but others may have accompanying learning disabilities and need a lifetime of specialist support. Additionally, people with autism may have a love of routines; special interests; and experience over or under-sensitivity to sounds, touch, tastes, smells, light or colours. Autism is part of the autism spectrum and is sometimes referred to as an autism spectrum disorder (ASD), or an autism spectrum condition (ASC). There are many other conditions that are also thought to be part of the autism spectrum, these include: high functioning autism; pervasive developmental disorders; atypical autism; and Asperger syndrome. You can read more about what autism is and how it affects people on the National Autistic Society Webpage. 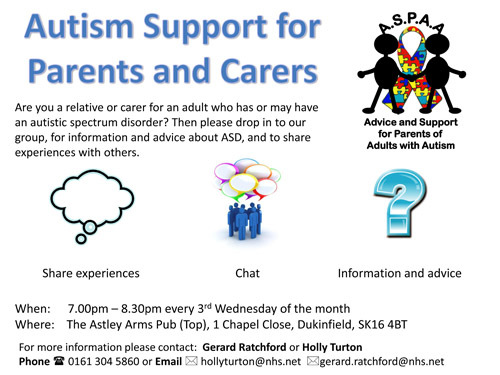 Another new group aimed at parents of adults with Autism Spectrum Disorder but also including partners of those on the spectrum and open to all those who know and/or support family members or friends. The group aims to provide friendship, understanding and sharing with others who might have similar experiences. Please see below for more information.